NASA's next-generation space telescope could confirm the existence of the oldest galaxy yet seen and peer back even further in time, according to researchers. Astronomers using NASA's Hubble Space Telescope announced Jan. 26 that they spotted a galaxy that formed less than 500 million years after the Big Bang, making it the oldest and farthest galaxy ever seen. While the scientists are confident in their discovery, a new instrument will likely be required to confirm the galaxy's exact age and existence definitively, researchers said. That instrument is the infrared James Webb Space Telescope, NASA's powerful successor to Hubble. JWST, which could launch in the fall of 2015, will also look back even further in time — to just a few hundred million years after the universe's birth, researchers said. "We're really pushing Hubble to its limits here," study co-author Garth Illingworth, of the University of California, Santa Cruz (UCSC), told reporters last week during a press conference on the oldest galaxy. "We're looking excitedly to the future, to using the James Webb Space Telescope to really unearth the earlier times that Hubble in fact won't be able to see." The researchers, led by Rychard Bouwens of UCSC and Leiden University in The Netherlands, performed a number of tests after the initial discovery. So they're confident that the ancient galaxy — named UDFj-39546284 — exists, and that it dates to about 480 million years after the Big Bang that scientists think began the universe, which is about 13.7 billion years old. To officially confirmfinds such as galaxy UDFj-39546284, astronomers usually measure spectra of the objects, so they can study their light in detail. Typically, scientists use ground-based instruments for such follow-up work. However, at about 13.2 billion light-years away, UDFj-39546284 is so faint and distant that no ground-based telescope can do the job Illingworth said. "Ultimately, to get the same level of confidence, we'll need the James Webb Space Telescope," he said. "This is incredibly faint. We can't do anything with our current ground-based telescopes on this." These images zoom into the Hubble telescope's HUDF WFC3/IR image around the galaxy UDFj-39546284, which scientists say is 13.2 billion years old - the oldest, farthest galaxy yet discovered. This image was released on Jan. 26, 2010. James Webb will also be able to peer back further in time, researchers said. Hubble's capabilities max out at about 480 million years after the universe's birth, but JWST should be able to see objects that formed just 200 million or 300 million years after the Big Bang. That difference may not seem like much, but it's a big deal, Illingworth said. Astronomers could gain key insights about the earliest epochs of star and galaxy formation. "The first stars may well have come together at about 200 million years," Illingworth said. "James Webb should take us back into a very important timeframe, when galaxies were really coming together." Though its promise is huge, researchers will have to wait a few years to put the telescope to use. JWST, long afflicted by budget overruns and delays, still has no estimated launch date, officials said earlier in January at the American Astronomical Society's winter meeting in Seattle. Last November, an independent review panel concluded that the telescope, once slated for launch in June 2014, could lift off no sooner than September 2015. But at a town hall-style talk during the meeting this month, an official stressed that that window is not binding. There is still no launch date for JWST as of now. "There are a lot of steps that have to happen before the agency commits to a launch date," said Eric Smith, JWST program scientist at NASA headquarters in Washington, D.C. "There is no such thing as a launch date for JWST. We're working on it." The JWST mission, led by NASA's Goddard Space Flight Center, is billed as Hubble's successor. The telescope has huge light-collecting power: Its primary mirror is 21 feet (6.5 meters) wide, more than twice as big as Hubble's. 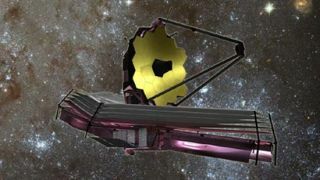 While orbiting about 1 million miles (1.6 million kilometers) from Earth, JWST will scan the universe in infrared light, helping astronomers study the early days of the universe, the formation of alien star systems and much more, NASA officials have said. Unlike the Hubble Space Telescope, JWST will not observe the universe in the visible light range of the light spectrum. NASA had estimated that JWST would launch in June 2014 and cost about $5 billion over its lifetime. But delays and cost overruns have long afflicted the instrument, which currently consumes 40 percent of NASA's entire astrophysics budget. The independent review panel, convened to look into the cause of JWST's problems, concluded in November that the telescope would actually cost about $6.5 billion, and that it could launch no earlier than September 2015. The panel found no fault with the telescope's scientific progress, instead citing long-standing budgeting and management issues. Indeed, JWST continues to move forward with its assembly and testing, officials said. Five of the telescope's 18 gold-coated flight mirrors are completely finished and tested, for example, and the other 13 should be done by the end of this summer, according to Mark Clampin, JWST observatory project scientist at Goddard. "The bottom line is, we made really good progress in 2010," Clampin said. The review panel made a number of recommendations to help get JWST back on track, and NASA is already incorporating many of them, Smith said. For example, the agency has reorganized the program's management structure, elevating it to a new organizational entity at NASA headquarters. "We now have the direct attention of the NASA administrator for this program," Smith said. Officials are also coming up with a new baseline cost for the JWST project, one that will be accurate with an 80 percent confidence level — another panel recommendation. Smith stressed that JWST officials know the program is being scrutinized more closely now, and that the new Congress — composed more heavily of Republicans, many of whom have pledged to cut federal spending — will likely be unforgiving of further budget problems. "We know that, when we rebaseline this program, we've got to get it right," Smith told SPACE.com. The new estimates of project costs and schedules will also be evaluated by at least two independent organizations, Smith added. When will JWST take to the skies? But much remains to be done before NASA can commit to a launch date, Smith said. For one thing, NASA and other federal entities — such as the Office of Science and Technology Policy and the Office of Management and Budget — will have to agree that the new JWST plan is satisfactory. In light of all that needs to be done, and all of the uncertainty, JWST officials don't think it's wise to commit to a launch date or to make any predictions. "A lot of people get themselves in hot water by giving a quick and dirty answer," Smith said. "We recognize that if we give you a quick answer, it'll probably be a bad answer."